We think that crispy pan-fried gnocchi with crème fraîche is not only super tasty but incredibly easy to make! 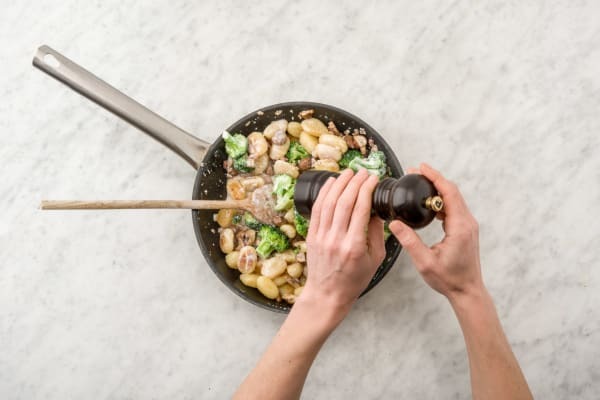 The gnocchi has a crispy coating and a pillow-like centre, accompanied by ‘meaty’ chestnut mushrooms, tasty broccoli, cheese and flat leaf parsley. 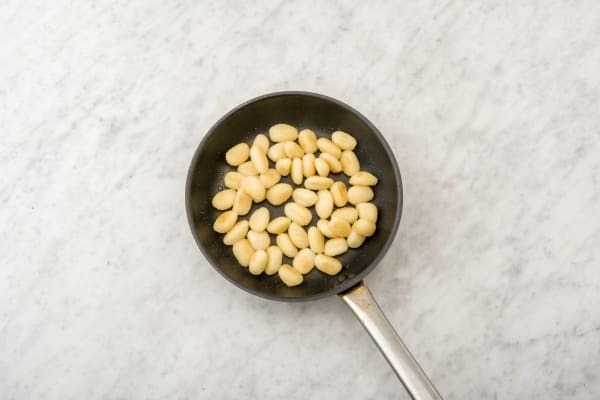 We think we’ve made our own delicacy with this twist on a classic Italian dish! Peel and finely chop the shallot and the garlic. 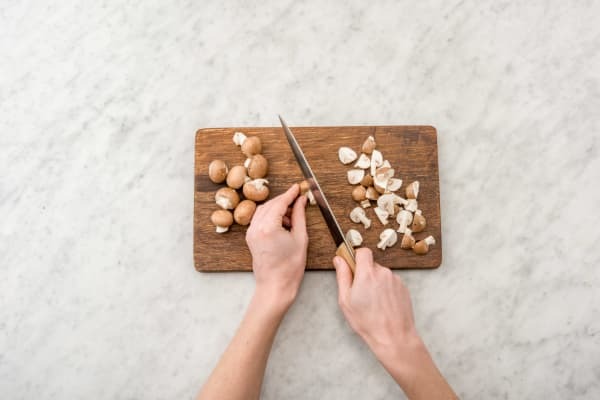 Clean the chestnut mushrooms (preferably by wiping with kitchen paper as this retains the flavour, but you can use water) and roughly chop. Finely chop the parsley. Heat a splash of oil in a frying pan over high heat. Add your mushrooms in small batches to make sure they go golden brown, then remove from the pan. Fry the pancetta in the (now empty) pan, until it starts to crisp. Then, add your shallot and garlic and cook for a few more mins. 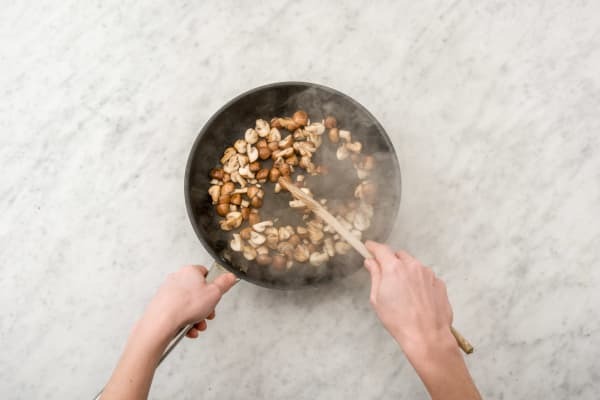 Return your mushrooms to the pan along with the water (as stated in the ingredient list), and a few grinds of black pepper. Allow to simmer over medium heat for 8-10 mins until thickened. Meanwhile, bring a pot of water to the boil with a pinch of salt. In another frying pan, heat a glug of oil on medium-high heat. When hot, add the gnocchi. Gently fry for 8 mins, until crispy around the edges. Remove from the heat. Meanwhile, cut the broccoli into small florets. Plunge into the pot of boiling water for 3 mins, then remove, drain and keep to the side. Stir the crème fraîche into your mushroom mixture. 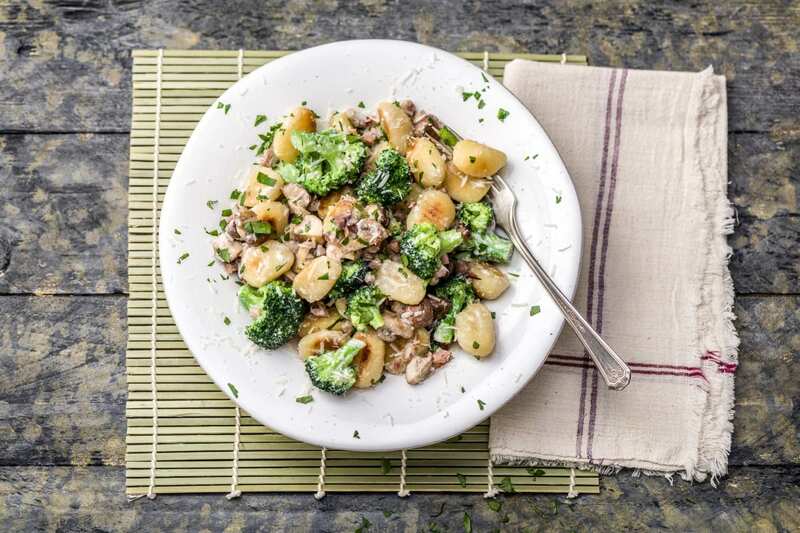 Add your gnocchi and your broccoli and give it all a good stir. Taste for seasoning and add more salt and pepper if necessary. Divide your gnocchi between your bowls and top with grated parmesan and your parsley.